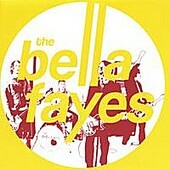 On their latest release, Far From The Discos, Portland, Oregon's rock 'n' roll quartet The Bella Fayes prove the third time is the charm, delivering a record of equally rocking, danceable, and melodic proportions. Whether they're discussing a heavy topic such as the existence (or lack thereof) of God. Or writing party rock songs about getting out there, feeling good, and having a good time (the title track), the band always has the guitars roaring, the rhythm section meaty and pounding, and charismatic front man Lael Alderman's zestful, lively voice up front. "Sad Susie" showcases the band's ability to layer, yet still deliver a crisp, clear sound, each guitar standing on its own, never being drown out by the other, the acoustic guitar as audible as its loud electric counterpart. "Love" is one of the album's standout tracks, a hook-laden, radio-friendly song that will find you singing - and dancing - along to this infectious ditty. Not to be outdone, "I Do Believe" follows "Love", delivering just as much guitar-led, rock-heavy pop as its predecessor, without sacrificing any of the other qualities that The Bella Fayes such a rare treat. A band able to capture emotion, make you think, want to sing along, and dance to each and every number on their album. Taking a breather on the spacey "Way Out Out There", the band proves they are not all meat-and-potatoes pop-rock, they can turn it down and send shivers up your spine with a melodic eerie-ness that will make you smile. Still not done, the post-punk-meets-power-pop of "If I Know You" recalls the glory days of college radio and indie-rock before it became a sub-genre rather than an attitude. Closing out with "Six Feet Under", the band goes out with a bang, creating an all-American rock song that would make any American rock legend proud. Far From The Discos is a fine offering from a band that is brimming with energy, melody, and a lot of fun to boot. If you're looking for a serious, yet good-time record that has the lyrics, the hooks, the voice, and, let's not forget, the power of rock, than look no further. I'll give this an A.